I am a big fan of green salads topped with fruit and nuts, especially when the nuts are glazed or spiced! I also love snacking on nuts – salted, spiced, glazed, smoke-flavored – I love them all. I’m not sure why I’ve never tried making something like this before, but these glazed walnuts were so simple I’m kicking myself for not trying it sooner. When I first saw Ellie Krieger’s recipe for Maple Glazed Walnuts, I was a little skeptical that they would turn out right. It just seemed too easy. If the recipe had been attributed to any other Food Network celebrity I’m not sure I even would have tried it, but I trust Ellie more than some of the others. I was lucky enough to meet Ms. Krieger last year during my cherry trip to Michigan. She did a quick cooking demonstration using tart cherries for a handful of bloggers, myself included. I’m not sure why I haven’t gushed about this before, but Ellie Krieger was super-friendly, absolutely beautiful, and a really great cook. Although I hadn’t really watched her show before, I became a big fan after meeting her in person and hearing her talk about food and cooking. I don’t have any of her cookbooks yet, but I’ve heard really good things about The Food You Crave and So Easy, and they’re both on my wish list! Let’s get back to the walnuts. I decided to go ahead and give the glazed walnuts a try, but thought the addition of some fresh chopped rosemary might be interesting. Well, I knew it would be interesting, but I was hoping it would also be good. It was. The recipe worked perfectly. 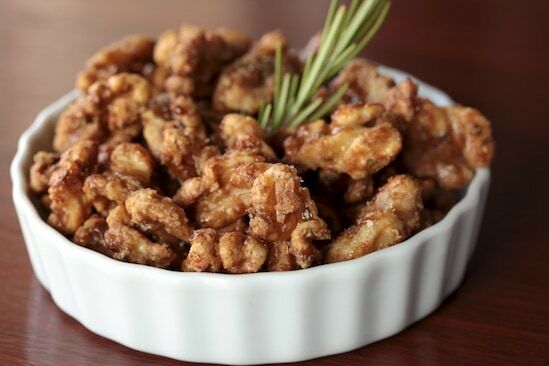 I ended up with delicious glazed walnuts in less than five minutes! The first thing I did – other than nonstop snacking on glazed walnuts – was make this delicious green salad with strawberries, blue cheese, and strawberry-balsamic vinaigrette. The walnuts were a perfect addition. Enjoy! In a small bowl, stir together maple syrup, rosemary, and a pinch of salt. Heat a dry skillet (I used nonstick) over medium-high heat. Add walnuts to the hot skillet and pour in maple syrup mixture. Cook, stirring frequently, until maple syrup has caramelized, about 3 minutes. Spread walnuts out on a sheet of parchment paper and sprinkle with a bit more salt if desired. Let cool. In a blender, puree strawberries, vinegar and mustard. With blender running on low speed, slowly pour in the oil in a very thin stream until it has all been incorporated. Taste and add a bit more oil if the dressing is too strong (I like my dressings a bit on the vinegary side, so I don’t add more oil). Season with salt and freshly ground pepper. Store in fridge, use within a few days. This is the kind of recipe I love bookmarking! Oh, Nic, those nuts would turn any dish into something extra special! What a beautiful, colorful salad - you've added my three favorite salad add ins: cheese, fruit and nuts, yum! This looks very similar to one of my favorite Nordstrom's Cafe salads! I love spiced walnuts and have heard great things about Ellie's cookbooks too. I am going to buy blue cheese and give this a try! Wow, you got to meet her? How cool! The walnuts and the salad both sound wonderful. How fun to meet Ellie Krieger. I do tend to trust her more than the others too, although I have one of her cookbooks and so far every recipe I've tried is a little under-spiced for my taste. Good basic ideas though. I tend to trust Ellie the msot on FN too. I have both of her books and have never been disappointed by any recipe. I feel like I've cooked more recipes out of her books than a lot of other cookbooks I own. Did you know she used to be a Ford model? Out of The Food You Crave, I recommend her sloppy joes, grilled zucchini stuffed with goat cheese, turkey meatballs, and lime peanut noodle salad. I could go on and on actually. OMG! I'm so doing this! I love walnuts and if there is a way to make glaze them without buying the harsh chemically laden ones in the store, I'm game! Love this post! Thanks! Looks so good. Can't wait to go out and buy some to make these. Yum!! I've made the sweet and spicy nuts from Smitten Kitchen before, but these seem like they would be just perfect on that salad - must try!! I love walnuts in my salad and now with your easy recipe for the glazed ones how could I go wrong? Your salad dressing should be a hit, too. 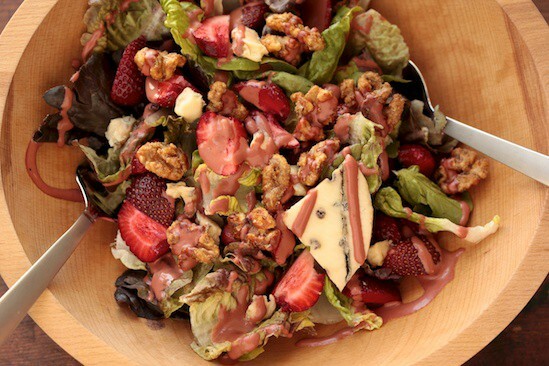 This salad has it all from glazed nuts to strawberries. This sounds both delicious and healthy! I'm going to post it on my Facebook page! I loved candied nuts, I really do. I made some strawberry vinegar the other day that I bet would go well with this salad also. I'll have to give it a whirl. This salad looks wonderful. Love the blogs and your great tasting, creative ideas. Thanks! I love absolutely everything about this salad. Just wow. Two of my favorite ingredients: Rosemary and Maple syrup. I will look to this for an amenity for our hotel. Thank you on that! Wow. Those sound really good. Such a great array of flavors! As soon as I saw this on food journal, I had to visit.It's funny rosemary, maple and walnuts scream fall to me, but I can see incorporating these into my summer salads with berries. Thanks for posting this! I love Ellie Krieger! I own her book with this recipe and have been wanted to try it for a while, I think I just might make these soon! The salad looks great too! Oh my! My mouth is watering! I love my cranberry walnut salad recipe, and my strawberry chicken salad recipe, but with fresh strawberries being in season and very sweet right now this sounds delightful! You're brilliant! I just purchased 2 lbs. of strawberries and needed a bright idea. I can't wait to make it! Thanks for posting this one! Those sound delicious. They will make an excellent party snack and a great change from the ordinary salted peanuts.